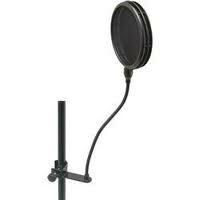 As you know it is very important to have a pop filter when recording. It helps disperse the air from a vocalist to eliminate any plosives, which are sounds that come from the letters "P" and "B". The Musicians Gear Double Pop Filter does double the job by having one pop filter to disperse air, then there is a bit of open air between a second pop filter that almost completely kill any unwanted plosives. It is pretty durable and a great price for the money. It sells for around $19.00 at Guitar Center. Click the link below for an exclusive deal.